Half Shot Shooters begins with the Three Stooges (Moe Howard, Larry Fine, Curly Howard) in the Army towards the end of World War I, doing what they do best — sleeping while trying to avoid work and danger. Their sergeant doesn’t take kindly to this and administers slapstick “discipline” to Moe, Larry, and Curly. Shortly afterwards, the war ends and the Stooges get their revenge on their sergeant, using a wooden plank with nails in it (really), and the kick of a friendly mule. However, things go downhill from there, as the Stooges are unable to find employment, and are soon begging at restaurant windows. An irate Vernon Dent (in his first appearance with the Three Stooges) sends them across the street to a place where they’ll find “employment” — and the Three Stooges unknowingly re-enlist in the Army! And who to starts “testing” them other than their old nemesis, Sergeant McGillicuddy, who starts by administering a “hearing test” — the boys put their heads under water, and the sergeant fires a pistol into the water, temporarily deafening them. This leads to some funny verbal humor, as the boys can’t hear the questions they’re being asked. Soon enough, the Stooges are back in the Army, and proving that there is no such thing as military intelligence, are assigned to loading the cannon under the supervision of their sergeant. After sending the Stooges back for the ammunition, the practice fire for the day is canceled — but nobody notifies the Three Stooges, who begin loading and firing the cannon at multiple targets, including a house and a bridge. At the end, the sergeant has had enough, and “fires” the Stooges — literally. A very funny short, recommended viewing. 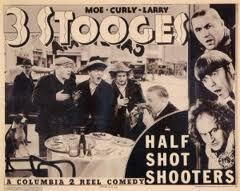 Half Shot Shooters is available on DVD as part of The Three Stooges Collection, Vol. 1: 1934-1936. Larry (Larry Fine): Pipe down! You’re spoiling the whole war for me! Moe (Moe Howard): What of it? Larry (Larry Fine): Nothing. I was just saying. Moe (Moe Howard): Republican? Naw, I’m a Democrat. Curly (Curly Howard): Not me, I’m a pedestrian! Capt. Burke: …wouldn’t know a shell from a boat. Larry (Larry Fine): What’d he say? Moe (Moe Howard): He says you smell like a goat. Larry (Larry Fine): Oh, yeah? Same to you! Curly (Curly Howard): Oh, the first shell went in there. It goes round and a round, woah, woah and it goes out there. Capt. Burke: Where were you born? Curly (Curly Howard): He says your pants are torn. Moe (Moe Howard)): I ain’t got any on. Larry (Larry Fine): Not worn, corn! Corn! Curly (Curly Howard): Oh, I got two on both dogs! Officer: Were you born in this country? Larry (Larry Fine): No, Milwaukee. Curly (Curly Howard): I seen my duty and I did it! Moe (Moe Howard): Every time you think you weaken the nation. Curly (Curly Howard): His mother and my mother are both mothers. Moe (Moe Howard): Boxcars wasn’t good enough for you, huh? Curly (Curly Howard): I don’t know, I’m a stowaway. Moe (Moe Howard): I don’t know where that one landed, but I hope it didn’t hit the pool room! The title is a pun on Half Shot at Sunrise (1930), an RKO Radio Pictures movie with Wheeler & Woolsey. This is the last Stooge short in which the old Columbia Pictures “torch lady” appears.